On average, we would expect the 19-year Jewish cycle and the 7-year Thanksgiving-on-November-28 cycle to coincide about every 19x7 years, which is to say, approximately every 133 years. And they sort of do. In 152 years from now, in 2165, Thanksgiving falls on the 28th, and you'd expect Hanukkah also to fall on the 28th, but it doesn't. If you you've been paying attention (and if you haven't given up yet), you may have noticed that I said "currently" when I explained when Kislev can begin. Remember Shmuel, who fixed the details of our current Jewish calendar in the first place? He, like everyone else back then, though that the year was 365.25 days long. This is why we have a usual year of 365 days, but every 4th year we add a leap day in February to make 366. The Jews, of course, didn't give a damn what Pope Gregory said. They kept using the Shmuelian calendar for their calculations. The Shmuelian calendar and the Gregorian calendar have been diverging at the rate of about 11 minutes a year, or 3 days every 400 years. Furthermore, the year 2100 will be a leap year in the Shmuelian calendar (because it's divisible by 4) but not in the Gregorian calendar (because it's divisible by 100 but not 400). So not long after the year 2100, the Jewish calendar and the secular calendar will diverge by an additional 1 day — though the details are even a little more nuanced, because Shmuel used a simplification of the final Jewish calendar. This is why (remember the question from several paragraphs ago?) 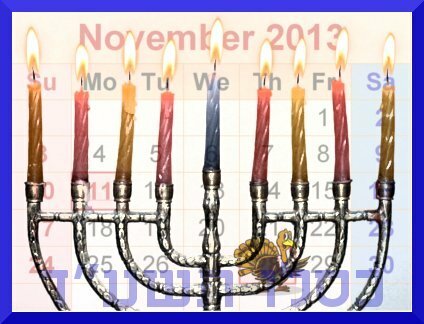 in the year 2165, when we'd expect Thanksgiving and Hanukkah to coincide again, Hanukkah will actually be one day later. Well, almost never. If the Jews don't ever abandon the calculations based on the Shmuelian calendar, Hanukkah will keep getting later and later — moving through winter, then into spring, summer, and finally back into fall — so that tens of thousands of years from now they will again coincide. 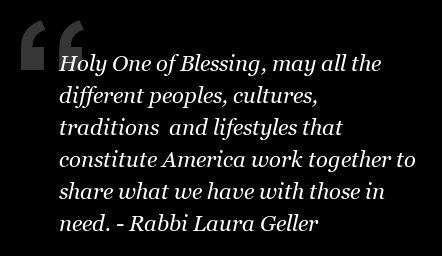 But long before then the springtime holiday of Passover will have moved deep into summer, so be on the lookout for a memo with a calendar update in the next several thousand years. And in the meantime, don't miss this opportunity to enjoy an exceedingly rare confluence of celebrations.